This wine is sold at our Lake George tasting room, the Queensbury Production Facility, and online! Available for both shipping or pickup. Our winemaker's artful blend of Merlot, Cabernet Sauvignon and Malbec Grapes, and aged in American oak barrels. A medium bodied, dry red with intense oak and earthy aromas, this wine delivers a velvety mouth feel and complex flavors of dark cherry, red berries and spice, with an enjoyable buttered toast finish. This premium Meritage represents our winemaker's artful blend of Cabernet Sauvignon (40%), Merlot (38%), and Malbec (22%) grapes, this Meritage was aged in first Vintage American Oak Barrels for more than 2 years. 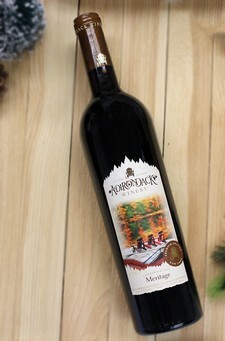 With the creation of this wine, Adirondack Winery is a proud member of the National Meritage Alliance. Meritage is an invented word that combines "merit" and "heritage" - reflecting the quality of the grapes and the ancient art of blending wine. Meritage wines are handcrafted red or white wines blended from the "noble" Bordeaux grape varieties. A Meritage wine is considered to be the very best of the vintage. Blending is the personal expression of the winemaker's vision, a combination of skill and intuition that unites the elements of the winemaking process to create a work of art. It is the magic that gifted winemakers use to create wines of intrigue and enchantment. While we love savoring this wine on its own, our Meritage makes a great match for a charred burger with gruyere cheese, mushrooms and onions. Think rich meats with earthy, nutty flavors and you will have an excellent meal. Wood-fired pizza and tomato-based pasta dishes with rich spices or meat sauces also pair well! Label Image: A trio of Adirondack chairs overlook Lake George in Autumn.